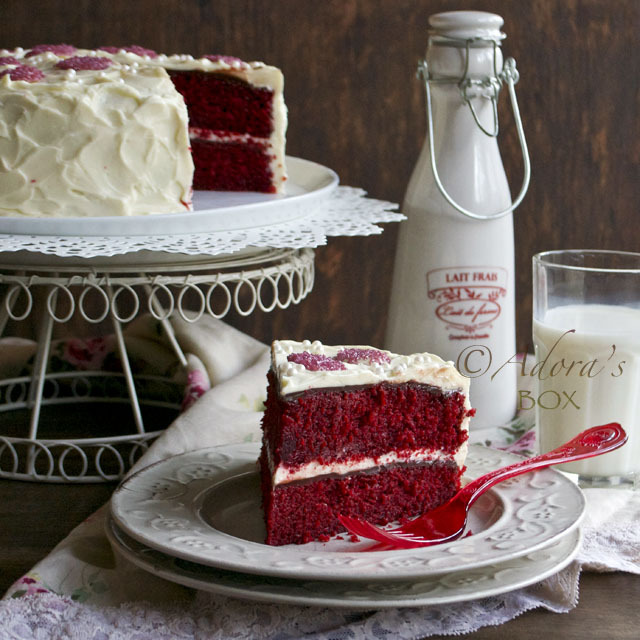 When it comes to food, being "old fashioned" is a good thing. New trends are churned daily but there are tried and tested classics that we keep turning back to. 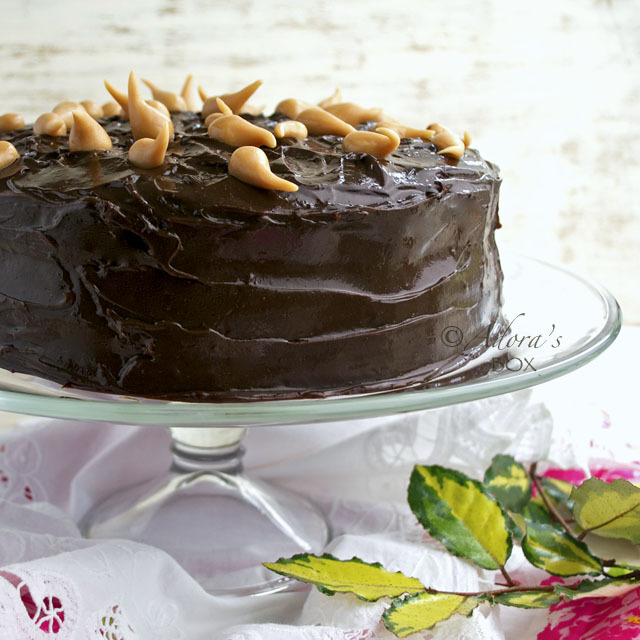 Chocoholics may beg to differ but I like my chocolate cake layered with other flavours. 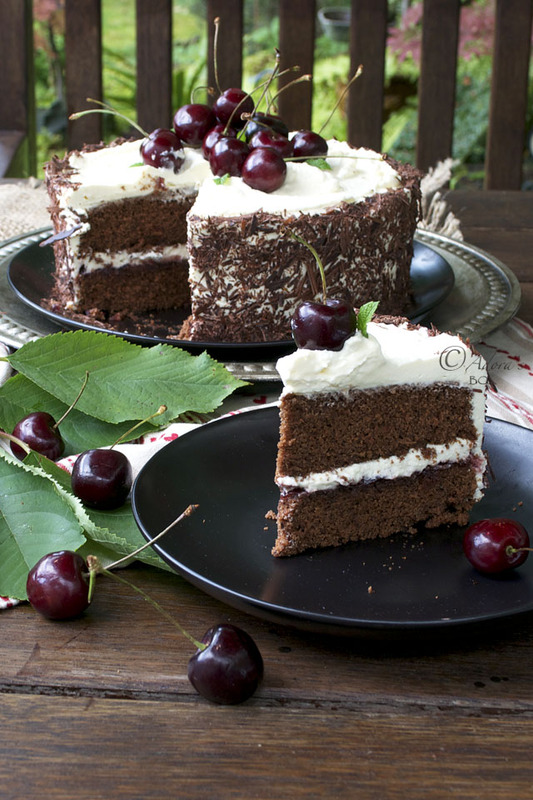 Black Forest cake has been a firm favourite because of its simple and elegant looks. 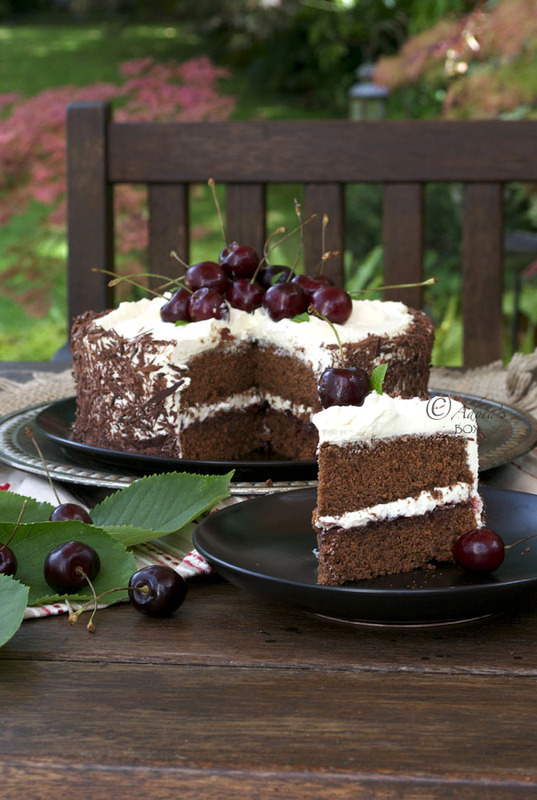 The combination of dark chocolate cake, cherries, cream and kirsch never fails to delight. There are many interpretations of this cake but having those four elements make it what it is. I chose a light, buttery cake for my cake base. I used a good quality cherry conserve from a jar as a timesaver. 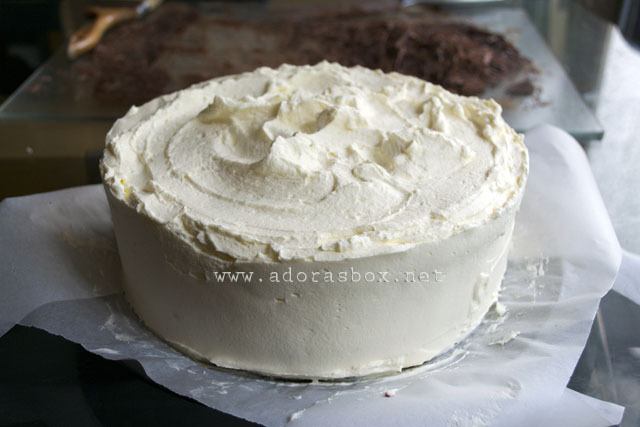 A cream frosting is the easiest icing ever as it is just cream whisked with sugar. Althouh I spent a little more time making chocolate curls, shaving a chocolate bar with a vegetable peeler would also give you a similar effect. I have tried other recipes before but this is the one that I like. It is not too sweet, not to dark but too delicious, but that's alright by me. 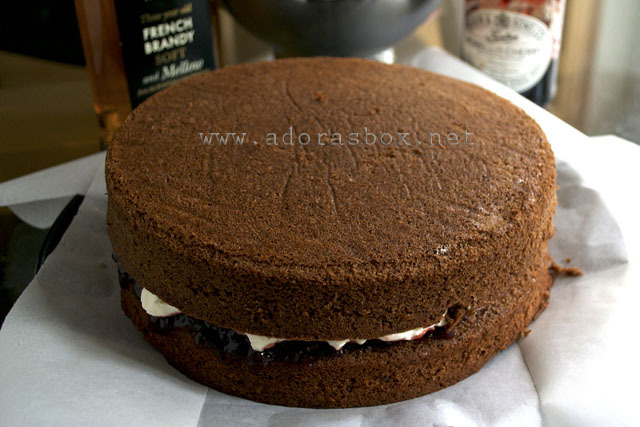 The original recipe calls for black cocoa which I didn't have so I used ordinary cocoa for the full amount required and this probably affected the colour of the cake. I used coffee instead of milk for the liquid because it heightens the flavour of chocolate. The recipe is effortless to make, too and but I simplified it further. 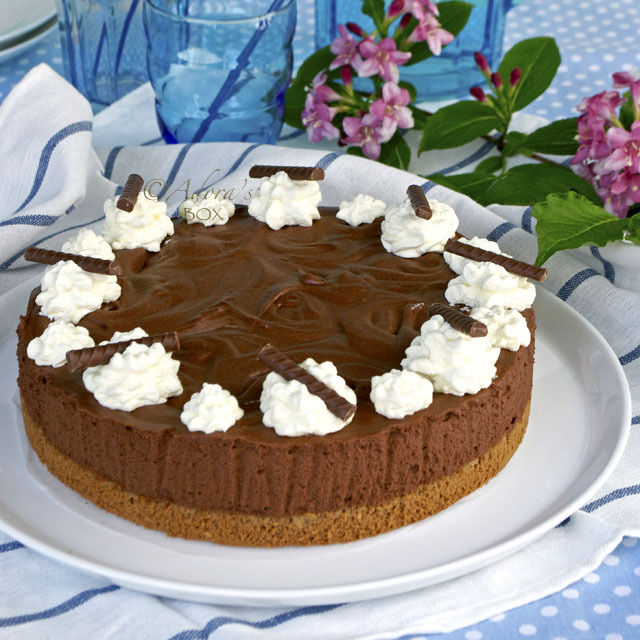 All in all, a great cake to make for special or simple occasions. This holiday season, go back to black. Preheat the oven to 350° F /180° C.
Line the bottoms of 2-8" or 2-9" cake pans. Grease the sides. Whisk together the butter until light and fluffy. Add the sugar and whisk again. 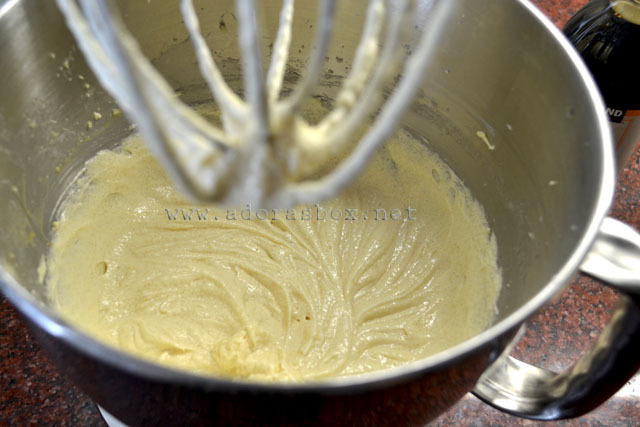 Add the eggs, one at a time, whisking well after each addition. 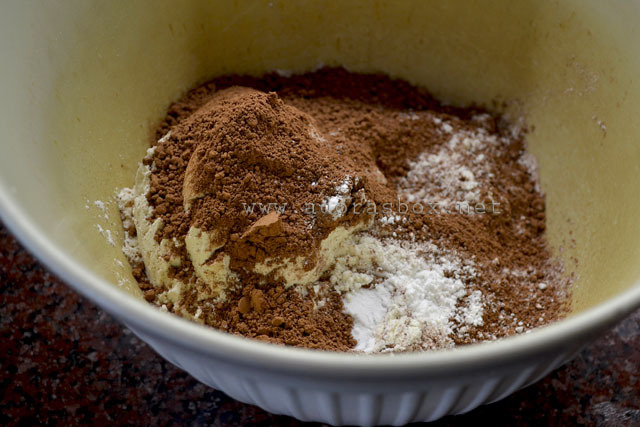 In another bowl whisk all the dry ingredients together. 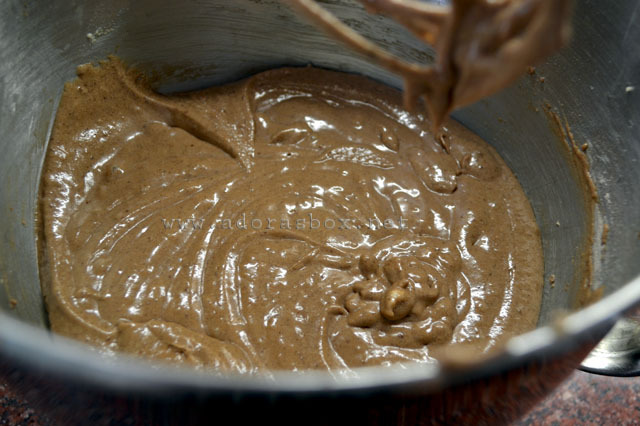 Add the dry ingredients, a third at a time, alternately with the coffee, to the butter and egg mixture. Mix after each addition. 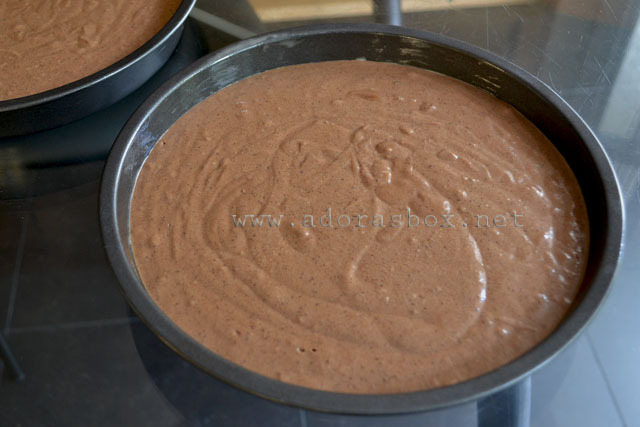 Divide the mixture between the prepared pans and bake for 20-30 minutes until the sides of the cake start to pull away from the sides. Take out of the oven. Let the cakes rest in the pan for 5 minutes before inverting onto a cooling rack. Meantime prepare the filling and frosting. 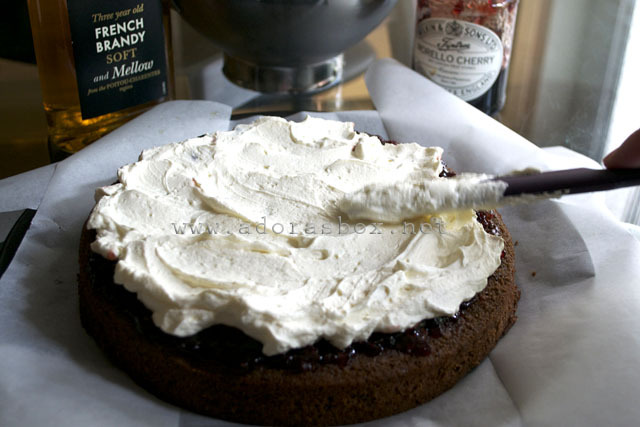 Put all the ingredients, except for the brandy and cherry conserve, together in a small mixing bowl and whisk to soft peaks. Refrigerate until ready for use. 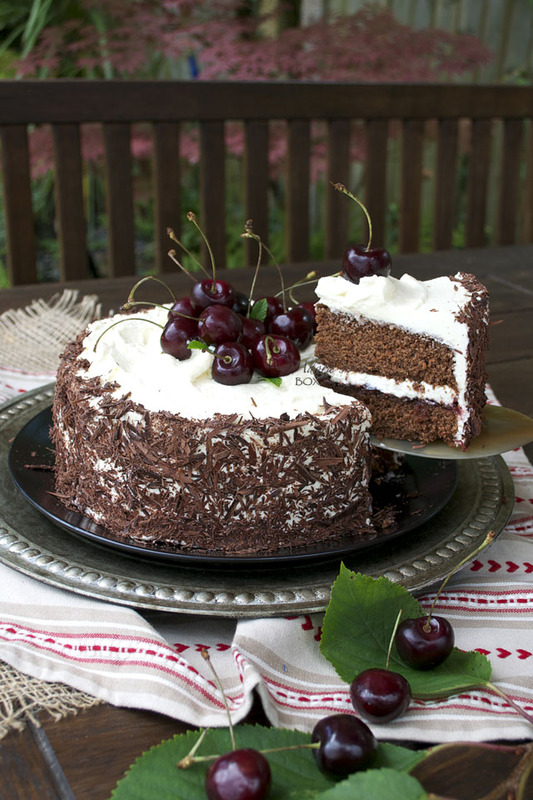 Lay one cake layer on a cake plate. Tuck in strips of baking paper under the cake edges to keep the plate clean. 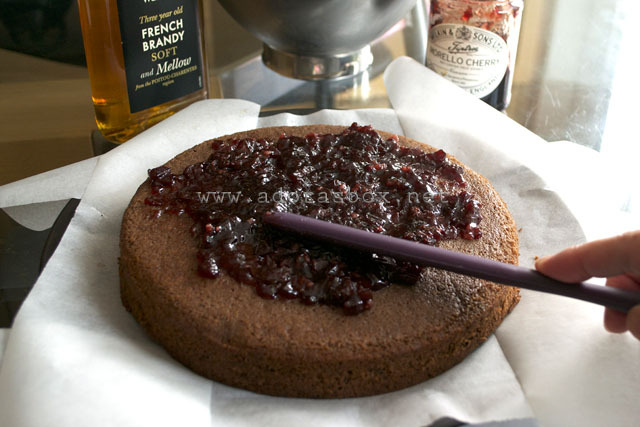 Brush the cake with the kirsch, brandy or cherry juice. Spread the cherry conserve evenly. Top with 3/4 c. of frosting and spread evenly. Top with the other cake layer. 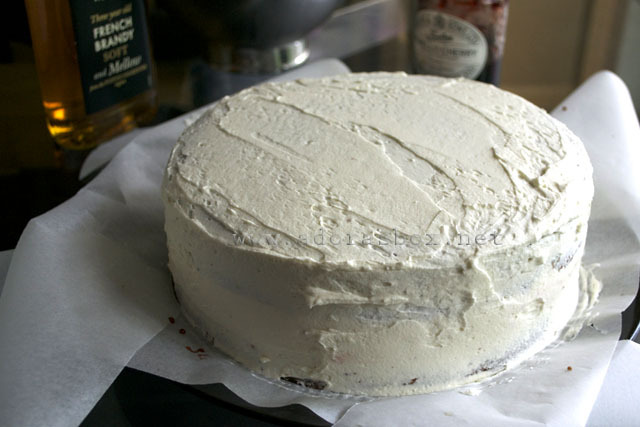 Spread a thin layer of frosting all over the cake to seal in the crumbs. Refrigerate for about half an hour. Use the rest of the cream to ice the cake. Rinse a metal spatula with warm water, dry and use to smooth the frosting on the sides. 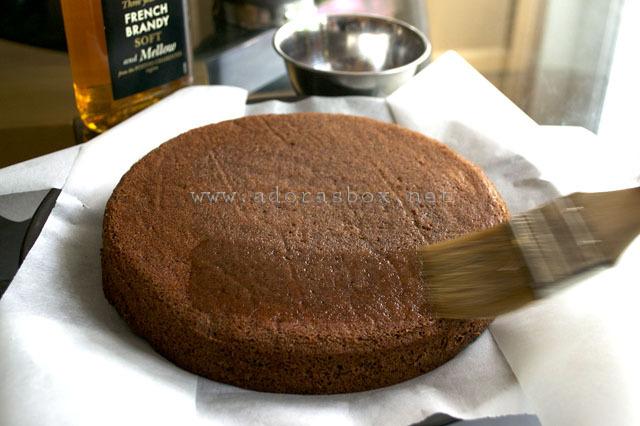 Use the rounded tip of the spatula to make swirls on top of the cake. Melt some chocolate in double boiler. Pour onto a smooth surface such as a tray. Spread thinly then refrigerate to set. Bring back to room temperature before shaving with the blade of a knife. Alternatively, you can use a peeler to shave curls from a bar of chocolate. 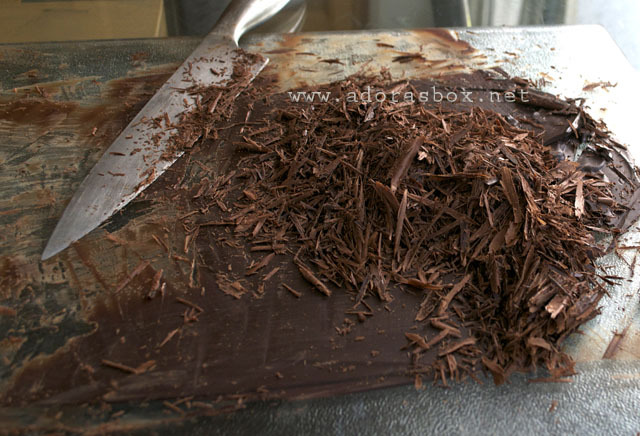 Rinse the spatula, dry and use to pick up the chocolate shavings. Pat onto the sides of the cake. 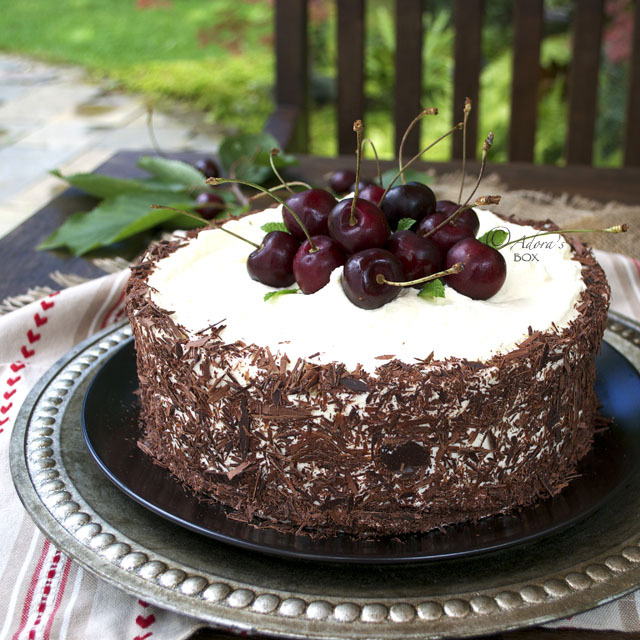 Use extra fresh or glacé cherries to decorate the top of the cake. 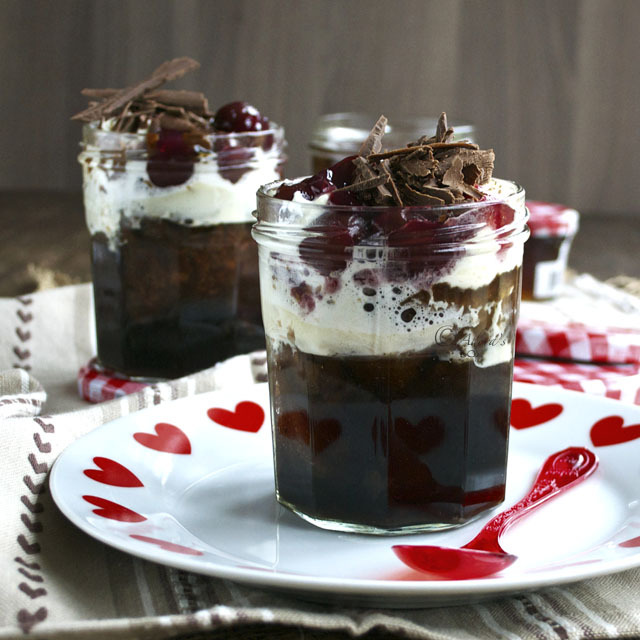 There is not a thing wrong with chocolate and cherry. In fact, it's my favorite! 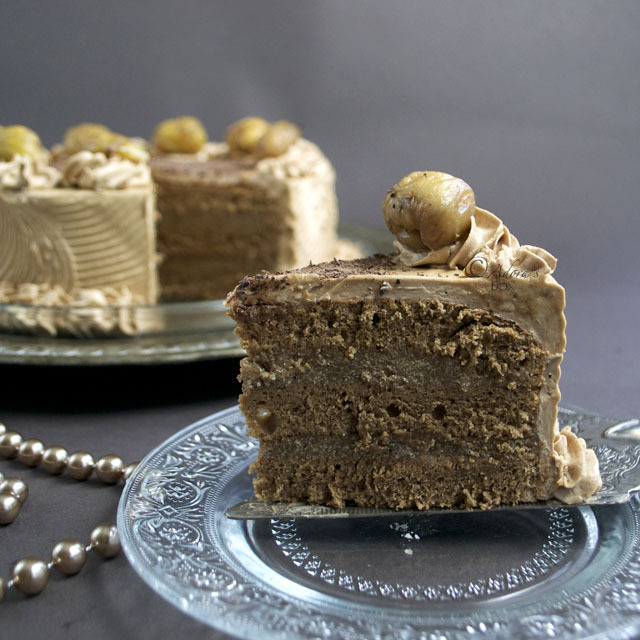 Your cake looks awesome and quite irresistible! mmm, that looks delicious! I've always wondered how to make chocolate shavings. Thanks!